Woodhead Construction is celebrating after a new build housing programme in Northampton received three national awards for considerate construction, taking home a Gold and Bronze as well as coming runner up in the Most Considerate Site award for a project under £500,000. 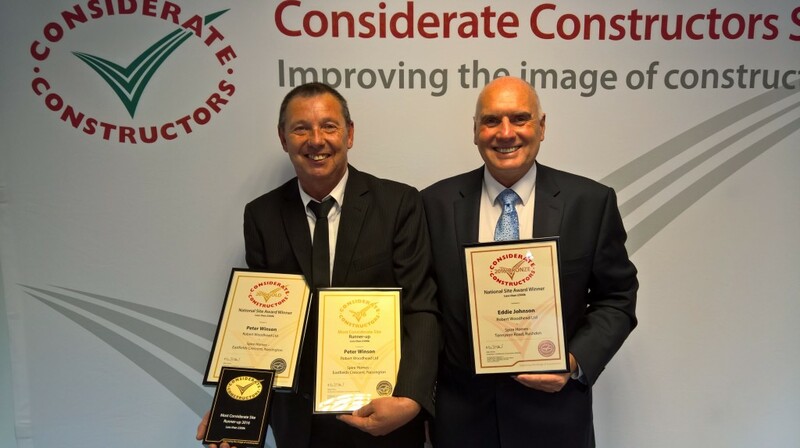 Two sites in East Northamptonshire, both delivered by Woodhead Living on behalf of Spire Homes Limited were recognised at the Considerate Constructor’s National Awards. Run by the Considerate Constructor’s Scheme, the awards recognise developments having gone the extra mile to deliver considerate construction projects. Eastfields Crescent, a small project to construct a pair of semi-detached houses on a brownfield site in Nassington was awarded a Gold Award and was also runner up in the Most Considerate Site award, putting it in to the top 1% of all sites across the country, an outstanding achievement for a small scale project. The Scheme’s Code of Considerate Practice is used to judge the awards and assesses the performance of sites in five areas – caring about appearance, respecting the community, protecting the environment, securing everyone’s safety and valuing their workforce. A second site, managed by Woodhead’s site manager Eddie Johnson, on Tennyson Road in Rushden involved the demolition of redundant garages and construction of a single detached three bedroomed house and 5 off-street parking bays. Simon Dillon, Project Manager for Longhurst Group Ltd. said “These two sites were part of a larger programme to redevelop nine garage sites across East Northamptonshire, for one of our Group Companies, Spire Homes Ltd.